Kinesiology is the science of human movement, and uses muscle testing to identify structural, chemical and emotional imbalances in the body. The evaluation and healing of these energy imbalances is brought about by a broad spectrum of manual and non-manual therapeutic procedures. This technique uses the body's own biofeedback system to restore balance where there are nutritional deficiencies and to create wellness at a physical, emotional and spiritual level. One kinesiologist developed his own system of tests which begin by determining whether the problem is based in the spiritual, emotional, or physical bodies, or all of the above. Without touching the patient he connects his index finger and thumb of his right hand. Then he places the index finger and thumb of his left hand into an interlocking circle with his right hand. He will silently go through a system of checks and balances on the patient's body by asking questions and getting answers based on the strength of the connection between the fingers as he asks each question. For example - he could ask about a liver problem -- tug at the circles created by his fingers. If the circles remain closed it would indicate a positive answer vs. the fingers separating which would mean a negative answer. He does this procedure quickly - guided by Spirit as he works. Once he determines the problem/ problems he continues on with the healing often combining it with homeopathic remedies. 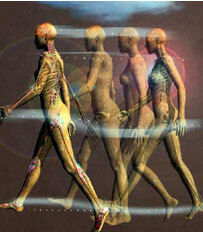 He believes that Kinesiology links with the electro-magnetic energies of the body to bring them into balance. A similar technique involves the patient standing in front of the practitioner his arm extended to his side. The practitioner will ask questions. As he does - he will press down on the extended arm. Resistance to lowering the arm will have one meaning - while a firmly extended arm will give a different response. Applied Kinesiology is a form of chiropractic introduced in 1964 by George Goodheart, D.C. It is a diagnostic method for determining health status through muscle testing and also a therapy wherein the practitioner applies light finger-tip massage to pressure points on the body or head in order to stimulate or relax key muscles. Nemo-Link a newly introduced therapy also includes a muscle test for diagnosis then disciplines the brain to assess and restore balance of the body and skeletal structure. Clinical Kinesiology was developed by an Alan Beardell 20 years after applied kinesiology was introduced. Precise manipulations called hand-modes are performed on the skull or arm muscles to heal musculoskeletal injuries, sports injuries, back and spinal pain.